We offer direct wholesale products to the general public at unheard of pricing, cash and carry, or the complete process including installation by our in-house installation team, Meadors Construction Group. To ensure your project has the best possible outcome, the following process has been developed in-house and approved by all state and local authorities. 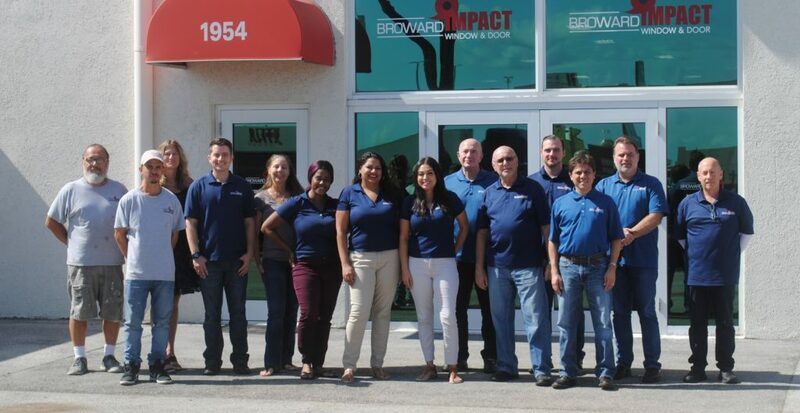 At Broward Impact Window & Door we care about your project, because your project is an extension of us! We bring with us to every project qualities like: our own in-house install team, on time deliveries, prompt responsiveness to every need, and quality workmanship with the best pricing we can offer. These qualities are part of our core company values and we insist that every one working with us share them as well. "Absolutely blown away by Broward Impact's excellent customer service and installation! The crew sent out to install, covered everything in the immediate area and did an excellent job of cleaning up as they went. Installation of the windows and doors was painless. A+ Rating!" "Our rep, Joseph, has gone above and beyond in terms of customer service. We have been struggling with getting the front door we wanted approved by our HOA and Joseph came to our neighborhood meeting tonight, after business hours, to speak on our behalf. Because of him, our requests were approved. I cannot speak more highly of him!" "Best hurricane window and door company in Broward County! I was lucky to deal with the owner, Dave Meadors, directly when purchasing new impact windows and doing the install. Dave was completely honest from the very beginning, from picking out the products to how the installation process would go.I would highly recommend Broward Impact to others. I have already sent one of my neighbors to them and they, too, are very happy with the job done!" At your facility/home or our 10,000 s/f showroom located on I-95 between Griffin and Sterling Rd in Dania Beach, Florida (Click Here For Google Map) This step may also include a site visit to your project to review requirements and verify measurements. Actual approval of our “build plan” for your specific project. At Broward Impact Window & Door we don’t provide you with “standard sizes” designed to appease the majority of the industry, we build product to fit your exact requirements, regardless of standard sizes. This ensures that you will have the best finished job anyone can provide. Elevations and floor plans are developed in-house specifically calling out each opening with respect to your requirements. Engineering calculations are done to develop specific wind load and pressure requirements to ensure that the product installed meets or exceeds your requirements. At Broward Impact Window & Door we are a fully State Licensed General Contractor. Licensed under Meadors Construction Group CGC 1514968 held by the company owner. We pull and process our own permits to meet state and local requirements. Material is ordered to meet your specific requirements. We buy direct, that’s all you need to know! We have developed relationships with specific manufacturers to bring you the best product to meet your specific needs. Due to our large buying power, we are able to sell to you at the best price possible. Complete in-house installation services provided by our team whom have dedicated their lives to serving customers like you. Our installation crews work directly for us and have a combined average of over 25 years of service specifically installing product. They take as much pride in their work as you do in your home. Our installation group is not only attentive of their work with you, but also with the inspection process. Although not mandatory by code, our lead installer from each project is present at each inspection for question and sign off. They don’t hide from inspection, but welcome showing off their work.